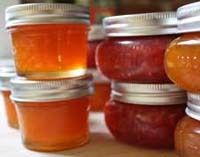 Learn basic canning skills in this hands-on workshop focused on making jams and jellies. The workshop will cover a host of topics and each participant will have the opportunity to complete a team canning project during the evening. In addition to learning about jams, jellies and other sweet spreads, participants will learn the steps to safely use the water bath canning procedure. We will also review resources for safe methods of making sweet spreads at home. Please wear closed-toe shoes and bring an apron and $5 for materials.